Theresa May will appeal to Leavers and Remainers to put a stop to their bitter feuding as she lays out her strategy for negotiating Britain’s departure from the European Union. 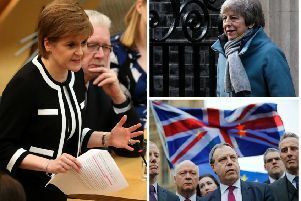 The Prime Minister is expected to give the most detailed insight yet into her approach to the forthcoming talks with Brussels in a major set-piece speech on Tuesday. Downing Street refused to be drawn on reports that she will set out plans for a “hard Brexit” - pulling of the single market and the European customs union in order to regain control of immigration and end the jurisdiction of the European Court of Justice. Writing in The Sunday Times, Brexit Secretary David Davis said the Government would be seeking to forge a “strong new partnership” with the remaining 27 member states. “We don’t want the EU to fail, we want it to prosper politically and economically, and we need to persuade our allies that a strong new partnership with the UK will help the EU to do that,” he wrote. He also indicated that the Government would consider some form of transitional arrangement - a move likely to be regarded with suspicion by hardline Brexiteers who have been demanding a clean break. “It proves necessary we will consider time for implementation of the new arrangements,” he said. Pro-Remain former education secretary Nicky Morgan, who was sacked by Mrs May, said the Prime Minister should put “maximum participation” in the single market at the “heart” of her negotiating strategy and warned her not to damage the economy. One of the themes of Mrs May’s speech is expected to be the need to foster unity by building “common goals” - such as protecting and enhancing workers’ rights - in an attempt to create a consensus after months of acrimonious exchanges. Most attention, however, will inevitably be centred on her approach to key issues around the single market, the customs union and free movement of labour. In their first report, MPs on the cross-party Commons Exiting the EU Committee said she should set out her plans in a Government white paper by mid-February. That would give MPs a chance to debate the Government’s strategy before she invokes Article 50 - signalling the start of the formal two-year negotiating process - which she has said she will do before the end of March. It is unclear however how much detail the Prime Minister will be prepared to reveal at this stage, having repeatedly stressed that she is not going to undermine her negotiating position by giving away too much too soon. Mrs May will deliver her address amid the 19th century splendour of London’s Lancaster House - scene of numerous international summits - a venue chosen to emphasise Britain’s continuing global leadership. The audience will comprise both the London diplomatic corps - overseas ambassadors and high commissioners based in the UK - as well as the full UK Brexit negotiating team. Preparations for the event take place as the EU’s chief negotiator offered the first hint of a compromise from Brussels to ensure member states continue to have easy access to the City, it is reported. Michel Barnier has indicated he wants the remaining 27 to have a “special relationship” with the financial markets of the City of London, according to unpublished minutes seen by The Guardian.